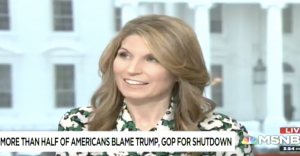 MSNBC host Nicolle Wallace on Monday cracked that working in the Trump administration nowadays only has downsides, including not being able to eat at restaurants, drawing laughter from her panel. Discussing the border security impasse between the White House and congressional Democrats that's led to the longest partial government shutdown in history, Wallace and her "Deadline: White House" panel ripped President Donald Trump's "abusive" treatment of his staff. Wallace said she didn't feel sorry for embattled acting chief of staff Mick Mulvaney, who Trump reportedly castigated in front of Democratic leaders Sen. Chuck Schumer (D., N.Y.) and Speaker Nancy Pelosi (D., Calif.). "What is the attraction for people coming into the White House at this moment?" New York Times editorial board member Mara Gay asked. Wallace called it a "resumé buster." "You need a lawyer … you can't eat at restaurants," Wallace said to laughter at the table. "You can't eat at restaurants, you can't eat in peace," Gay said. "What is the attraction?" Press secretary Sarah Sanders was asked to leave the Red Hen restaurant last year due to her work on behalf of Trump, and Homeland Security Secretary Kirstjen Nielsen was screamed and chanted at by left-wing protesters in a D.C. restaurant over her enforcement of the White House's border policies. Senior adviser Stephen Miller was also jeered at for eating at a Mexican restaurant due to his support of policies separating illegal immigrant parents and children. Other prominent Republicans have also been yelled at in restaurants over the past year, including Senate Majority Leader Mitch McConnell (R., Ky.) and Sen. Ted Cruz (R., Texas). Rep. Maxine Waters (D., Calif.) drew a rebuke from party leaders last year when she encouraged members of the "Resistance" to form crowds and shout down any Trump officials they saw in public.